If you have ever tried to create a WPF application which has a larger memory footprint (>500MB) you will notice some random hangs in the UI which become several second hangs for no apparent reason. On a test machine with a decent Xeon CPU I have seen 35s UI hangs because WPF frequently (up to every 850ms) calls GC.Collect(2). The root cause of the problem is that WPF was designed with a business application developer in mind who never gets resource management right. For that reason WPF Bitmaps and other things do not even care to implement the IDisposable interface to clean up resources deterministically. Instead the cleanup is left as an exercise for the Garbage Collector with the Finalizer thread working hand in hand. This beauty is calling GC.Collect(2) every 850ms if in between no Bitmap was allocated or every 30s regardless of how many Bitmaps were allocated. With .NET 4.5 we have got concurrent garbage collection which dramatically reduces blocking all application threads while a garbage collection is happening. For common application workloads a "normal" .NET application gets 10-15% faster by doing no change to the code. These improvements are all nullified by calling a forceful full blocking garbage collection. 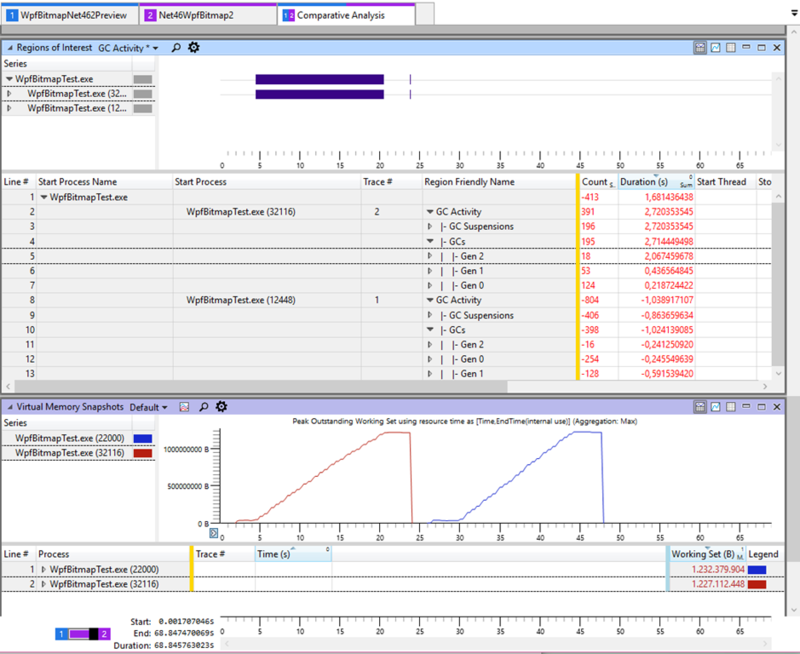 To demonstrate the effect I have created a simple test application which allocates on a background thread 1 GB of small objects while on the UI thread we allocate one WPF bitmap every 850ms and compare that to allocating an "old" WinForms Bitmap object also every 850ms. img = BitmapFrame.Create(myBitmapStream2); // WPF Bitmaps have no Dispose method! 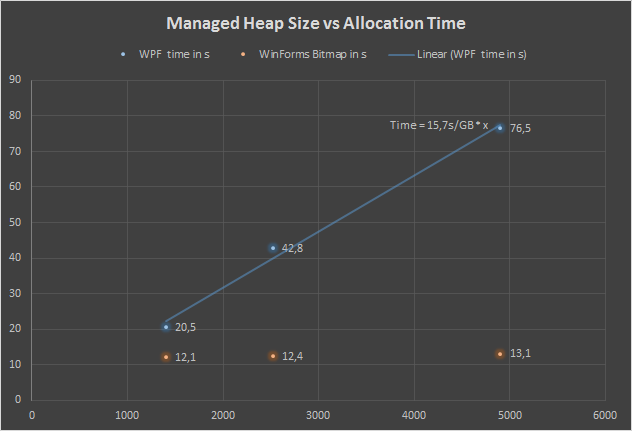 If you measure for some heap sizes you quickly see that your application will become dramatically slower the more memory it consumes due to the forced blocking garbage collection caused by WPF. The x-axis shows the managed heap size in MB and the y-axis shows the time needed to allocate 1 GB of small objects in a background thread. which tell you that you need to use Reflection to set private fields in the internal MemoryPressure class of WPF. Not exactly a production grade "fix" to the issue. But there is hope. The new public beta of .NET Framework 4.6.2 contains a fix for it. The MemoryPressure class is gone and your Stackoverflow "fix" will cause exceptions if you did not prepare for the impossible that Microsoft did dare to remove internal classes. 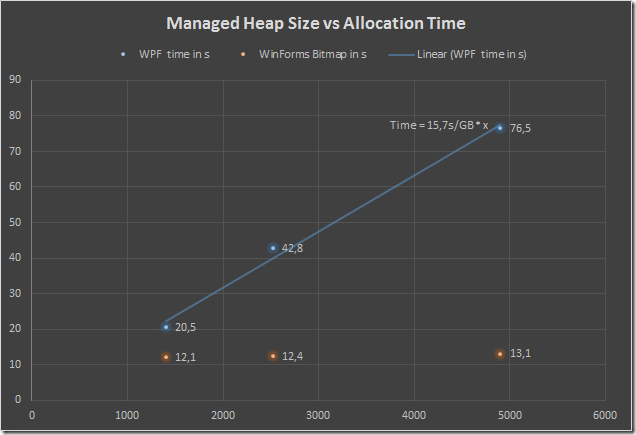 WPF now adheres to the long time recommended GC.AddMemoryPressure call to tell the Garbage Collector that some managed objects also consume significant unmanaged memory. There you can clearly see that while the managed heap grows the Induced GC times get bigger just as you would expect from the GC regions. To get the same view you need to download my simplified WPA profile which I have updated with the latest stacktags I found useful during past analysis. 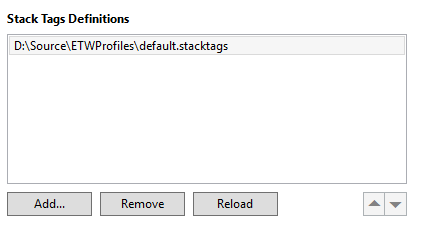 To make that active you need to open from the menu Trace - Trace Properties and remove current file and add the downloaded stacktags file. Or you can also simply overwrite the default.stacktags file that comes with WPA. The new improved stacktags file gives you fast insights into your application and your system which is not really possible with other tools. With a nice stacktags file you can create your very own view of the system. 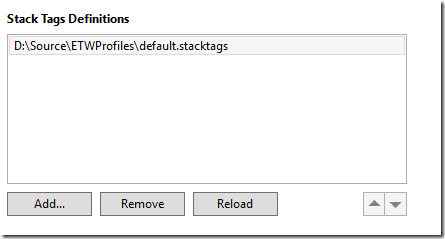 The updated stacktags file contains tags for common serializers, exception processing, and many more things which are useful during analysis of performance issues or application failures. I remember running into this problem with a large WPF app in 2010 and having to hack around it. Still remember the problems with BitmapSourceSafeMILHandle. Microsoft Support at the time closed my support ticket as "by design", glad to see they are finally doing something about it even if I haven't touched WPF in years, I wonder if the Visual Studio team requested the fix. Thanks for the great article. Danke Alois für deinen Blog! Aktuell bin ich damit beschäftigt einen Rendering Server zu implementieren der Kartendaten on-the-fly rendered. 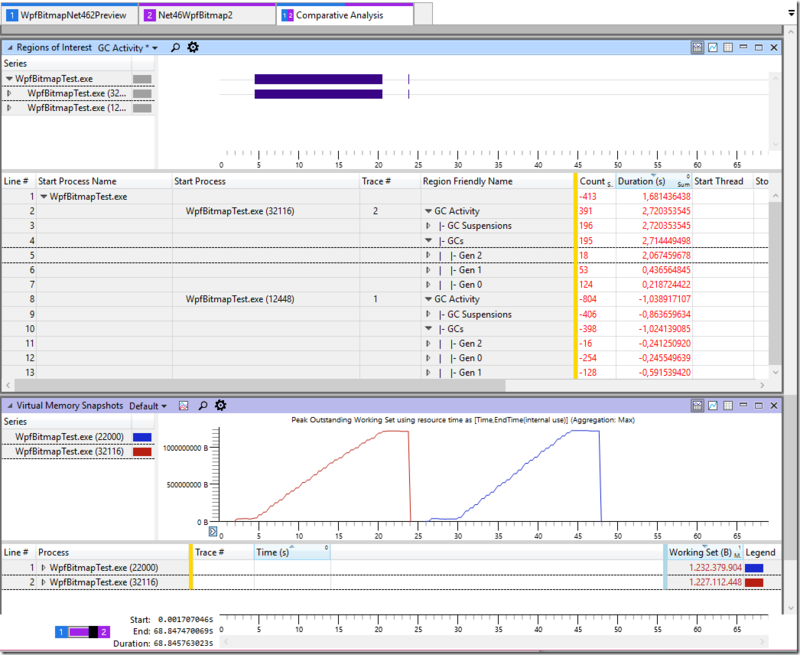 Lastentests zeigen mir, dass eine Menge an nativem Memory allokiert wird (Modul: wpfgfx_v4000.dll) obwohl ich nur managed WPF Klassen verwende. Habe nachdem ich deinen Eintrag gelesen habe mal auf 4.7 als Zielplattform umgestellt - bislang sieht es gut aus! Wie auch immer - vielen Dank schon mal für deinen Input!